Our church celebrated it's 160th Anniversary in Sept. 2003. We begin this page about the Cuba United Methodist Church with a bit of it's history. The following excerpts are taken from history compiled and written in 1976 from the long research and extensive notes of Mrs. Fred (Zelda) Allis who consulted many sources over the years for her work, and edited by Mrs. Frank W. Williams Jr. The hearts of Methodists in the Cuba area have been "strangely" warmed since 1820 when the Methodist Society held meetings in homes. Cuba became a township in 1820, and worship continued in stores and in the old wooden school on Maple Street under Rev. Jacob Hager who is listed as pastor in 1840. On January 15, 1843, a meeting to incorporate was called of male persons of full age and the resolution passed and certificate of incorporation was granted and filed in Allegany County Clerk's Office in 1843. In 1850, also the year of the Cuba Village incorporation, the first church was erected costing $2000.oo raised by subscription, o lot at corner of Spring and Chapel Streets. 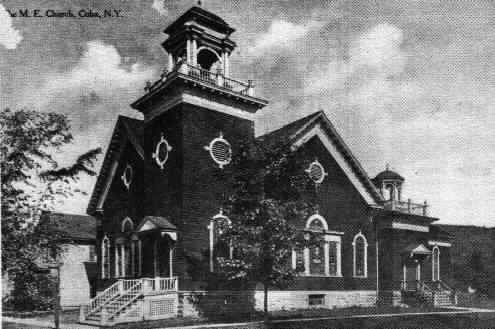 In 1894, forty-six years after the erection of the first building, a new Methodist Episcopal Church was built on the same site 300 x 400 feet, at a cost of $6000.00, with seating for 300 or 400. The existing organ was repaired and refinished. On September 14, 1896, between two and three hundred citizens assembled at the corner of Spring and Chapel Streets to witness the laying of the corner stone of the New Methodist Episcopal Church. On June 16, 1910, the jubilee of burning the morgage took place, initiated by mellow tolling of the new bell over the countryside; this bell was the donation of Mr. A.A. Arnold, not a member of the congration. Those who participated in the burning were Walter Renwick, Sr. A. C. Fisher, the Rev. J.N. Shank, who was pastor. 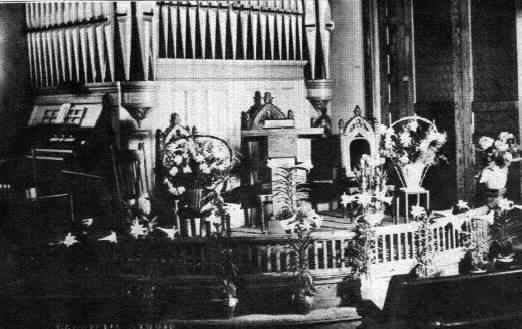 Frank W. Williams, Sr. and George DaBolt, Sr.
Five years later, the church was completely refinished and redecorated and the installation of a pipe organ, and a complete electric light system was accomplished. Just two and one-half years after these great improvements and additions, the church burned to the ground - February 8, 1918. The cause remains a mystery. Due to the cold season, ice was in the mains and slowed water pressure. 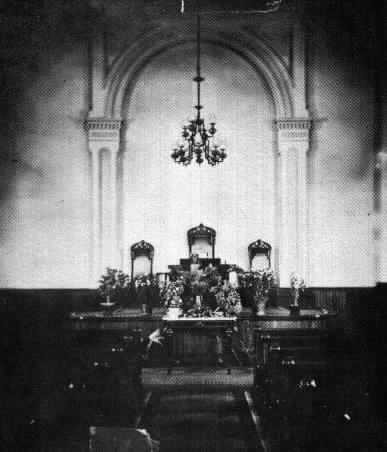 The parsonage was saved from the disastrous 1918 fire, as were the pews, which still grace the Cuba United Methodist Church on the corner of East Main Street and Green Street. A difficult time for the church members was to follow, made harder by the fact that our nation was embroiled in World War I. The members met in the Presbyterian Church, The Baptist Church, the WCTU Hall on South Street, the Keller Opera House, and the Hicks store. Finally, arrangements were made to purchase the Universalist Church long abandoned, which had been built on the corner of East Main and Green Streets in 1870. 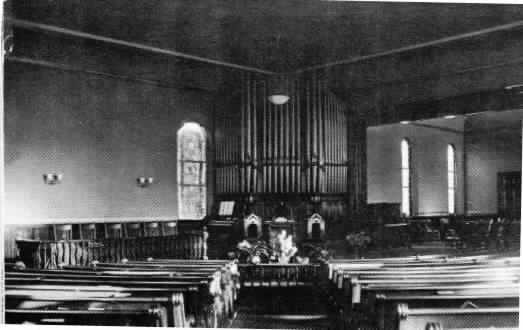 Extensive repairs and remodeling were undertaken; the pews salvaged from the fire were installed and remain to this date. June 1919 marked the dedication of the "fine new home" debt free, in what must be an unique experience in Methodism. The windows are worthy of note as they may still be seen. The one thing perhaps most remarked by the crowd which thronged the building for dedication services of the new Methodist Church that Sunday and since, is it's close resemblance to the old church home which burned, in interior arrangement. Through surpassing it in beauty, it is almost alike in every detail so far as concern the seating, the location of the organ, the Sunday School room and so on. The bell, which is a very good one, with a distinctive tone was donated by the late A.A. Arnold, who had also given the bell for the church that burned. In 1956, the need for more room and improved facilities was felt by the Methodist congregation of the Cuba church, and a contract was let to Jordan Lumber Company of Cuba for an addition to contain beginners, kindergarteners and primary rooms on the second floor, and a dining room with fireplace and kitchen on the first floor. Much vlunteer labor has assisted in the frution of this fine edifice. In the sixties and early part of the seventies there existed an ongoing maintenance problem with the parsonage located at 40 East Main Street, almost across from the church. In June 1977 there were different ideas being discussed regarding the parsonage problem. Alternatives ranged from a proposal of adding insulation at a cost of about $400 to a proposal to build a brand-new parsonage at a cost of $40,000. On August 9, 1977 the Administrative Board voted to try to sell the old parsonage at not less than $12,000 with a requirement that the new owner put at least $4,000 more into improvements. A buyer was found and a Charge Conference on August 24th authorized the sale of the old parsonage. A special Charge Conference authorized the purchase of an available building lot on Champlain Avenue. Certainly the events of the summer and early fall of 1977 were surprising to many and almost miraculous to others. The progress of October, November, and December would seem like a double miracle. Weather, which had prevented construction projects from starting hand hampered others with one rainy day after another, changed for two weeks and allowed the contractor to get the concrete slab poured. Later the weather cleared some more to allow the contractor to get the shell up and the roof on. Many money contributions were paid early giving the special parsonage account money to buy supplies and materials without the need to borrow all the funds. The scarce and absolutely essential insulation was obtained. By vacation time when extra help was needed, college kids were available and they helped paint the interior. Wiring supplies and materials came when needed and on one Saturday morning many of the men in the church received a short course on house wiring. e Even bad weather helped, for just at the end, when most things were done but some final coats of paint on the walls, a storm closed school for two days and the teachers of the congregation came out to add those last coats of paint. A church pulled together in time of need. By the end of January 1978 the parsonage was finished and the pastor and his family moved in. Although the old parsonage and then the new parsonage occupied much of the sixies and seventies, other thing were taking place within the church as well. In 1960 the wash rooms upstairs at the church were converted to the pastors study. In June 1965 the church became a one-point charge, separating from Hinsdale. In 1966 a gate was cut in the communion rail and the alter area received new carpeting. New red hymnals were purchased in 1968. During the sixties two programs were evident in the church aimed at young people. On Saturday mornings for two or three years "Fun Days were held. These two-hour morning sessions gave those children in grades kindergarten through six an opportunity to meet at the church for Bible stories, crafts, games, plays, movies and other enjoyable activities. Another program called "Friday Night Coffee House" provided a place for teens to assemble, talk, snack and socialize after basketball games. This program was active during the winter months of the late sixties and was totally ecumenical.